In an effort to mix up the fish I eat, I’ve expanded my fish selection from salmon, to salmon and tilapia. When looking for different ways to make tilapia tasty, I stumbled across the absolute best tilapia recipe ever – garlic alfredo tilapio. When making it, I adjusted the recipe to one serving. Which made for some problems. Like what is the difference between tsp and tbsp? How many tsps are in tbsps? Luckily I googled that and it turns out google really does know everything! They have this nice converter where you can figure out how many is in each thing. You really do use math after college (but google does all the work for you). It was pretty fabulous. But next problem – it turns out you have to unfreeze tilapia before you cook it. So I put the tilapia in a bag and put the bag in a pot of water. But the directions on the tilapia packaging said the water had to be cold, so that’s why there is ice cubes in the pot. 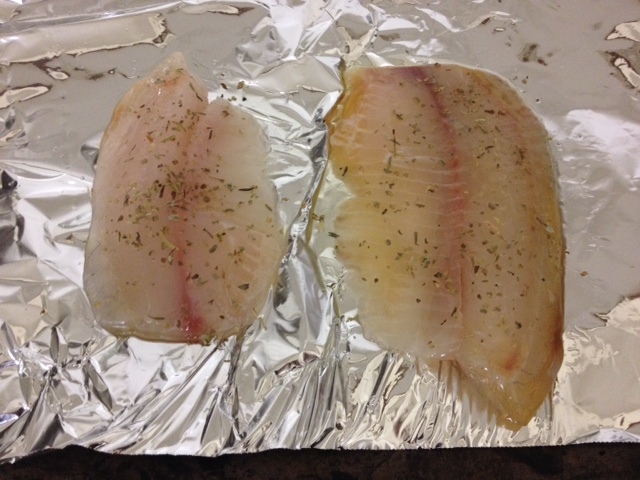 Then after the tilapia was no longer frozen, I patted it dry with a paper towel and put it on tin foil. I wasn’t able to find the creole seasoning in the grocery store, so I ended up using Italian seasoning. Which most likely gave it a different flavoring but I loved it! While the fish was in the oven, I put the butter, garlic, and alfredo sauce in a pan. Once the fish was done, I used a fork to do the fork test, which my roommate told me about. You put the fork in the fish and twist, and if it breaks easily into flakes, it’s done! You then put the sauce on the fish, add more seasoning and voila, a delicious meal.